Hi friends. Tonight’s post is going to be a quick one. Unless inspiration suddenly hits and I get chatty. But I don’t think I have time to be chatty. What with this whole new schedule and all, I feel like a chicken with its head cut off just trying to accomplish all my daily tasks on top of being at work most of the day. How do people live like this?!!! I mean…Sure, I’ve done the whole work thing before, but I had that piled on with grad school, teaching group ex classes, and traveling to and from NY every weekend. Not sure how I managed all that, but I certainly thought it would be easier just having ‘work’ on my list. But, life changes (thank God, or else I’d still have braces and glasses and let girls kick me) and now I’ve gotta think about meals and two dogs and a husband and a whole friggin house to clean. So where was I? Yeah, the short post. 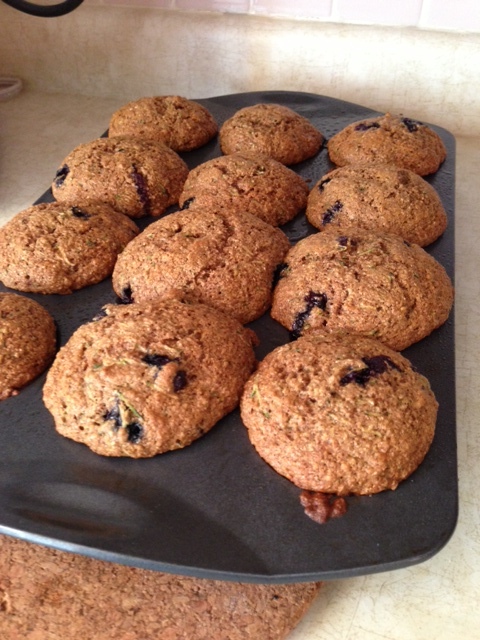 Yesterday, I mentioned in my day of eats that my late afternoon snack consisted of whole wheat zucchini blueberry muffins. Just wanted to drop in and share the recipe with you because they are so good I get giddy when I eat them. After the muffins fully cooled, I put them in ziploc bags in groups of two. Most were for me, some were for Tyler, and none were for the dogs, although we found that Reggie somehow got onto the counter (they were sitting on the counter pushed ALL THE WAY back) and ate one of the bags. His poop was green. You’re welcome for the extra information. 1. Preheat oven to 350. Prepare a muffin pan. 2. Combine all ingredients in a bowl except zucchini. Stir until fully incorporated. 3. Fold in the shredded zucchini. Thanks! I’ll be making these soon! Is it just me or are blueberries mysteriously missing from the recipe? Yum! The last time I made zucchini bread, I failed to add enough sweetener (aka the bananas and I cut down the sugar thinking I was super healthy) and it was a sad day. But maybe if I make these I will redeem myself! These look good! Do you think the baking times/temps are different at all with the altitude in Calgary?? Just wondering! theyre almost always different. I usually dont have to cook things as long. When I bake new-to-me things, I tend to watch the oven for the last 15 minutes or so and constantly check so I can determine the best time!